Tibet travel is one of the popular tour destination in Asia. Tibet travel information / Tibet general information required to know by travelers who prefer traveling in Tibet. Tibet (Xi Zang in Chinese) lies North of India, Nepal, and the great Himalayas lies an ancient land unparalleled in its beauty and majesty. 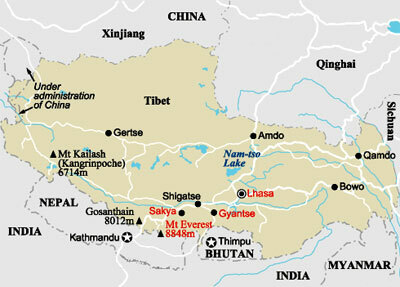 Tibet travel referred to as the roof of the world, is the largest and highest plateau on earth. Traveling to Tibet is a once in a lifetime experience where you will see /enjoy with beautiful landscape, lush valleys, Holy Mount Kailash and Mansarovar lake, Potala palace, touch the Mount Everest, Tibetan culture and their warm hospitality. 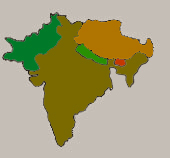 Its population of 2.3 million people come from a variety of ethnic groups including Tibetan, Han, Monba and Lhota. The world's lowest valley, the Grand Yarlun-tzanpo River Valley lies in east Tibet. Travel in Tibet has various trip package such as Tour in Tibet, Trekking in Tibet, Expedition in Tibet. For Traveling in Tibet required Tibet travel permit through Chinese Embassy Kathmandu. Tibet has been fully incorporated into the Peoples Republic of China. Since Tibet has been open for travel Apex Nepal Adventure provide the essential information for traveling in Tibet. Travel in Tibet Tibet offer real good offer great adventure opportunities for all those who seek to explore the lesser known places in the world. Lhasa is capital city of Tibet. Tibet Lhasa iaccomplishment is unique and amazing. The modern world had never seen a region so rich in culture and spirituality that was so capable of self government. Its unique Buddhist culture, magnificent wildlife, and grand peaks have been sealed from outsiders for years. Tibet is a culturally, religiously, ethnically, and geographically distinct. Tibet is a luxury that all who look experience a rich in south Asia adventure tour must include in their trip for tranquil adventure package tours. To reach the Tibet there are several option from different destination that mean directly flight from Bejing - Chengdu than enter the Lhasa, Kathmandu by flight to Lhasa gogar airport then enter the Tibet, Kathmandu overland journey to Tibet border ( Kodari) than enter the Tibet, Nepal Simikot than enter the Tibet so all above places Apex Nepal Adventure offer all type of adventure package trip, sightseeing tours, Tibet Himalaya trekking, Tibet Himalaya mountaineering according to trekkers /travelers desire and wish. It is freezing cold in most time of the year. Most tourists come to visit Tibet only in the warmest seasons, June, July, August and early September is the best season for Tibet travel. We Apex Nepal Adventure heartily invite for Tibet travelers to explore the high Himalaya, stunning landscape, Monasteries and Tibetan cultures for life time journeys!! Kathmandu - gonggar : a twice-weekly flight operates between Kathmandu and Lhasa from the beginning of April through October and sometimes till November depending upon the weather conditions. The 55 minute flight offers spectacular views of the Himalayas and the southern Tibetan plateau. An approach that has great appeal for hardy and adventurous travellers is to enter or leave Tibet by road, following the footsteps of explorers who for more than a century tried (and usually failed) to reach Lhasa overland. The Chinese governments prohibits individual traveler to visit Tibet. The Chinese embassy will only issue visas to travelers on group tours i.e if there is a single tourist or a tourist group of less then 05 pax then they will have to join a group in order to get a visa. Art objects and antiques in Tibet fall under special restrictions forbidding their export. Anything made before 1959 is considered an antique. Rugs may be bought and exported, so may the small religious objects that are sold in open markets, providing only one or two are taken as souvenirs. Customs officials have been known to confiscate jewelry or other objects if they consider that a tourist has purchased 'too much'. Tibet is cold in winter, cool in summer and generally dry, receiving only 450 millimeters or rain or snow. Sunlight is extremely intense. The thin air neither blocks nor holds heat, so sunshine feels warm, shadows are chilly, and temperatures can vary greatly within a day, exceeding 29 degree Celsius (84 f) in desert areas in summer, and plunging below 4 degree Celsius (40 f) the same night. The most pleasant months for tourism are from April to October. Clothing should be simple and consist of layers which can be added or removed as the temperature varies during the day. A warm windbreaker and stout comfortable shoes are especially recommended. Formal attire such as a necktie or dress is never needed - trousers and sweaters are the style. Lhasa now has many pharmacies selling Tibetan, Chinese and some westerns medicines but, it is advisable to bring your own comprehensive first-aid kit, sunglasses with good ultra-violet protection, sun block and lip cream and a flashlight is important because many interesting sights are poorly lit. There are no air routes within Tibet. The distances are huge and the only recommended mode of transportation is hiring the vehicles from the travel agent. Traveling in Tibet is an adventure involving high altitude and could be strenuous. While most visitors have only minor effects from the altitude, we advise specially the guests with known heart or lungs or blood diseases to consult their doctor before traveling. Mild headache, fever, loss of appetite or stomach disorder can take place in a process of acclimatization. Our advice for better acclimatization, drink 4 liter. Of water minimum a day, do not exhaust yourself so much, breathe deep and take rest more than usual. Seriously ill travelers should not consider trying to leave Tibet by road, as the difficulties and uncertainties of such a journey pose unacceptable risks. Your only choice is to fly. Banks in Tibet/china are closed on Saturday & Sunday. So, you are kindly requested to carry about US $ 100 per person in cash over and above the tour cost to cover your extra expenses for main meals and others enroute until Lhasa. If it is cash dollars, even local people help you to get them exchanged in Chinese yuan. Travellers cheques & credit cards are very difficult to be cashed outside the banks especially Outside Lhasa. The unit of currency is yuan . Us$ 1 = 8 yuan. International mail is reliable and quite fast if sent by airmail. Idd phone and fax services are available in up market hotels.